Should I Be Worried About the Western Tent Caterpillar? | Mr. Tree, Inc.
Any tree owner living in the Vancouver area will quickly learn to watch out for the various signs of local pests. Tree pests can come in a variety of forms and their effects can range from a minor inconvenience to a deadly blight. Some are even capable of killing the trees that host them. The cool climate of Washington provides ideal conditions for certain pest species, and so anyone responsible for the care of trees should conduct occasional inspections for signs of infestation. Black spots underneath the leaves, for example, can be a telltale sign of a fungal infestation, which can prevent water from circulating through the leaves of the tree. Cankers in the bark could indicate a bacterial infection, while piles of a sawdust-like material around the base of the tree hint at the presence of carpenter ants. If you notice the signs of any infestation, the best option is to contact your local arborist. Arborists, or tree surgeons, are trained to diagnose problems such as infestations and take the necessary steps to aid the tree and prevent the pest species from spreading to other nearby plants. Not all infestations have obvious signs, and as such it’s a good idea to have your tree inspected by a professional arborist every once in awhile anyway just to be safe. One potential pest species that Vancouver arborists are becoming wary of is the Western Tent Caterpillar (Malacosoma californicum). The Western Tent Caterpillar is found throughout all of Western North America. It is a moth larvae that have a particular interest in deciduous trees. They are also known to inhabit shrubs such as sumac and bitterbrush. Individual tent caterpillars grow to about 2 inches in length and can come in a variety of colors, most commonly featuring a blue head with black markings across the body. As a tent caterpillar, the larvae are unusual in the fact that they are social. Tent caterpillars form colonies which create large silk tents in the branches of the trees that host them, making them very easy to spot. The eggs of this species of caterpillar hatch soon after the end of winter as the leaves are starting to reappear in the deciduous trees that host them. As the caterpillars emerge, they seek out other caterpillars to form tents with. The colonies they form can contain as many as 350 caterpillars. The tents will be constructed so that the caterpillars can receive the warmth of the morning sun. Depending upon the number of caterpillars that inhabit it, these tents can grow to be very large, sometimes covering entire branches of the host trees. Over the course of five or six weeks, the caterpillars will mature and grow larger. Eventually, the caterpillars will form white cocoons. Ultimately, after about two or three weeks, the Western Tent Caterpillar will mature into a yellowish, or tan-colored moth. Because they live in colonies during their larval stage, they can form into swarms of adult moths once they have matured. Now, the question you may be asking, is the Western Tent Caterpillar harmful? Is it a pest you should be worried about? The answer is, yes and no. While the Western Tent Caterpillar is certainly a pest and can certainly harm trees, there are many pests that can cause quite a bit more harm. It is extremely rare for the Western Tent Caterpillar to actually do any serious damage to a tree; although they will defoliate it and leave it looking unhealthy and unsightly. Other pest species can actually kill your tree, although their initial appearance may not be as dramatic as the silk tents of the Western Tent Caterpillar. Controlling an infestation of these caterpillars is actually fairly simple. Since the tents appear and are very obvious, you should easily be able to remove them by hand. You can also prune away small branches that you see tents forming on. The pruned branches should be disposed of far away from the trees in order to prevent the caterpillars from returning. Placing them into a bucket of soapy water is one option you have to prevent the pests from spreading. You can take further steps to control the caterpillars by attempting to attract their natural predators; having a birdbath nearby your tree can draw birds that will find Western Tent Caterpillars to be a tasty snack. Beneficial insects can be attracted by planting flowers such as basil and dill nearby. One thing you should try to avoid is the use of chemicals; this can potentially do more harm than good for your tree and kill off the beneficial insects in addition to the harmful ones. 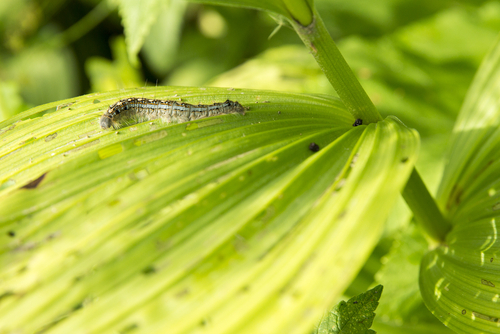 If you are struggling to get rid of your caterpillar infestation, or if you have a particularly tall tree and cannot easily reach the tents that are forming in the branches, contact your local arborist rather than attempting to climb to them yourself. Arborists are trained to access high branches safely and in a manner that will not harm the tree. Regardless of what kind of infestation you are faced with, it’s a good idea to have your tree regularly pruned and inspected by a professional arborist. While it’s certainly possible to be diligent and catch problems on your own, it’s also important to occasionally have a professional come to ensure your tree is healthy. If you live in the Vancouver area, Mr. Tree Services is an excellent option for your tree care needs. We can provide inspections and, if we detect an infestation, we can provide your tree with the care it requires. We specialize in both residential and commercial tree care and are trained to deal with problems in a safe and effective manner that will protect your home and property. If you require tree removal, stump grinding, or other services, we can provide those as well.